Here is a list of Best Free Keyboard Status Indicator Software. These keyboard status indicator programs let you know the current status of various keyboard keys (Caps Lock, Num Lock, Scroll Lock, Insert, Alt, Ctrl key etc.) on screen. These programs are very helpful when there is no hardware LED on your keyboard, like wireless keyboards or many laptop keyboards. Some programs make a sound notification when the status of these toggle keys changes, while some display a balloon popup or simple popups near taskbar. Some of them are portable and do not require installation and can be run from USB pen drive too. In my opinion, Keyboard LEDs is the best keyboard indicator software in this list, as it has lot of features. For e.g. you can change the size and opacity of the on screen display. You can also try these best free On-Screen Keyboards, Piano Software, and Screen Magnifiers Software. Keyboard LEDs is a small, simple, and easy to use keyboard status indicator program. It shows the status of Num lock, Caps lock, and Scroll lock on your screen. It is a useful program for notebooks, laptops, and wireless keyboards that have no LED indicators. It stays in the system tray of your PC and comes with many customization options. You can configure it to run on startup. It can beep on change of lock state. 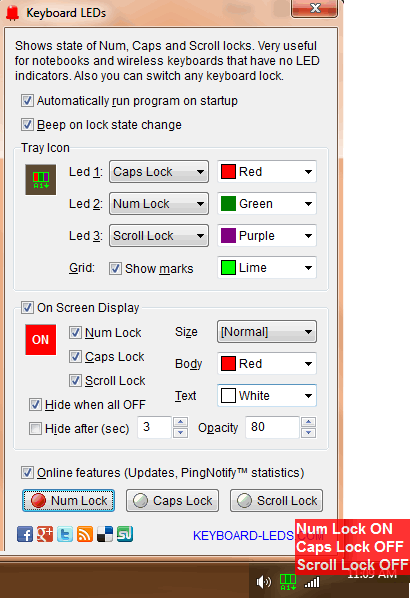 It shows a tray icon in the system tray and you can choose different colors for num lock, caps lock, and scroll lock. You can also configure it for On Screen Display of the current status of these keys. The size and opacity of the On Screen Display can also be changed. TrayStatus is a free keyboard status indicator software. It lets you view the status of various keyboard keys in the system tray. The supported keys are: Caps lock, Num Lock, Scroll lock, Alt, Ctrl, Shift, and Win. The green icon of the respective key shows the active/on state while grey icon shows the inactive state. It also shows the hard disk activity in the system tray. Read Bytes Threshold and Write Bytes Threshold can be configured for hard drive activity setting and shows the current speed in a tooltip. Keyboard Indicator is simple and easy to use open source portable program which lets you know the state of Num lock, Caps lock, and Scroll lock key on your monitor. The program does not require installation and it comes in a ZIP format. You can configure it according to your choice. For e.g. you can change the text labels, fore color, back color, font, opacity, interval (in milliseconds), style (Normal, Sticky Horizontal, Sticky Vertical), position or location of the message, etc. You can also configure it to start with Windows. AlomWare Lights is a simple and lightweight application which lets you know the current status of Caps lock, Num Lock, and Scroll lock keys in the system tray. To let you know the current LED status of these keys, it changes the color of respective key from Purple to Orange in the system tray. It also has a feature of making keys permanent on or off for Caps and Num lock keys. For e.g. it has Caps lock always off and Num lock always on feature and it can be controlled from system tray. Wireless Keyboard Indicator is very small and easy to use keyboard status indicator software. It is available in portable format (no need to install), also it does not leave any traces in the Windows Registry. It display the current status of Num lock, Caps lock, and Scroll lock keys as well as Ctrl keys (R/L). The program comes in handy when your keyboard doesn’t have LEDs to display the current status of these keys. It display a message box when there is a change in the state of these keys and also in the system tray through highlighted bars. The program is just 97 KB in a RAR file and you can run it from a USB drive also. Caps Lock is another free and useful utility which keeps you informed about the status of both the Caps Lock and the Num Lock keys. It gives an auditory warning (beep) every x number of keystrokes pressed. For e.g. if you set x = 5 and make Caps lock key active, then after pressing every 5 keystrokes, it will give you a beep. It sits in system tray and you can configure it from there by right clicking on its icon. DK: Keyboard-Status is very simple and easy to use keyboard status indicator program for Windows. It display a popup balloon in the system tray whenever there is a change in the state of Num Lock, Insert, or Caps Lock keys. It also make a sound whenever Caps Lock key is pressed (On or Off). The program is very small (just 19 KB in ZIP file) and is portable in nature. The program is helpful where keyboard lights are not present. Keys is a simple program which shows the current status of Caps Lock, Num Lock and Insert keys on screen. It can be kept on top of other windows also. It can be configured to make sound when Caps Lock, Num Lock and Insert Keys are in ON state. Keyboard Notifier is a very small (just 17 KB in a ZIP file) and easy to use portable software which lets you know the present state of the Caps Lock, Num Lock, and Scroll Lock keys in system tray. Just extract it and run it from any folder. It displays the color bar for each toggle key sated above. You can customize the notification colors for each key separately. Keyboard Indicator is a bit different type of toggle keys notifier software than the ones listed here. It can display the current state of any one of the toggle key: Caps Lock or Num Lock or Scroll Lock key. You can configure it for only one desired key. Now whenever the state of that key changes, it display a popup in the taskbar. This is a good software if you just want to track status of one key (Caps Lock, for most of the users).